Congratulations to Jocelyn Dunlop on winning our twenty-second High Five Giveaway and thank you to all who entered. 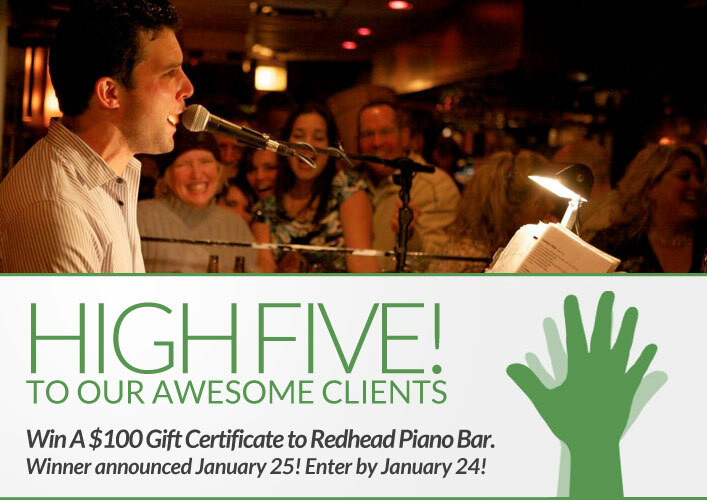 Our next High Five Giveaway is for a $100 gift certificate to Redhead Piano Bar. How many dollars did you help us raise for Feeding America at our 2012 Holiday Benefit on Decemnber 6? Hint: See here for the answer! Now, just add a comment to this post with the right answer to be eligible to win! The winner will be announced on Friday, January 25. Entries must be received by midnight on Thursday, January 24. All who attended the Holiday Benefit and donated helped raise $13,164 or the equivalent of 105,312 meals…WAY TO GO!!! $13,164 which is 105,312 meals for individuals right here in our own community who may not know where their next meal is coming from! Congratulations XEX! Raising $13,164.00 will really help a lot of people.